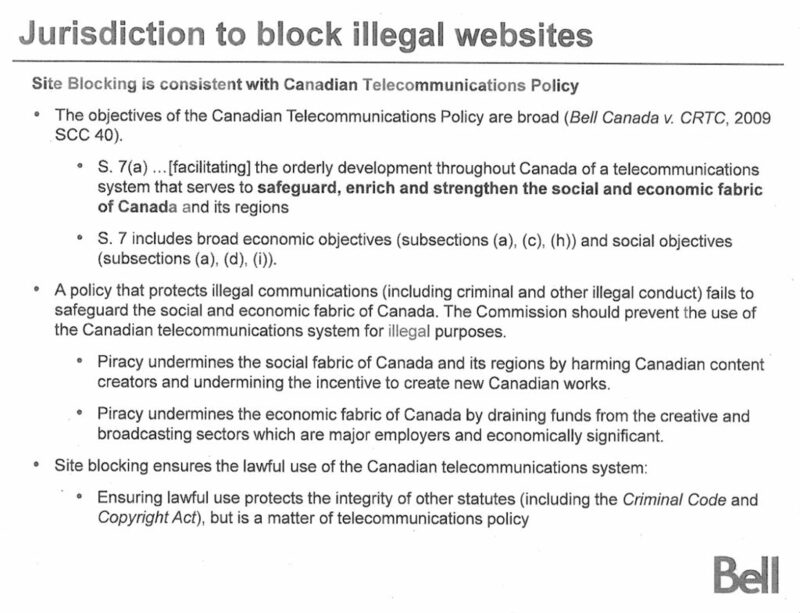 The revelation that Bell met privately with the CRTC to present its site blocking proposal months before it became public garnered considerable attention yesterday. 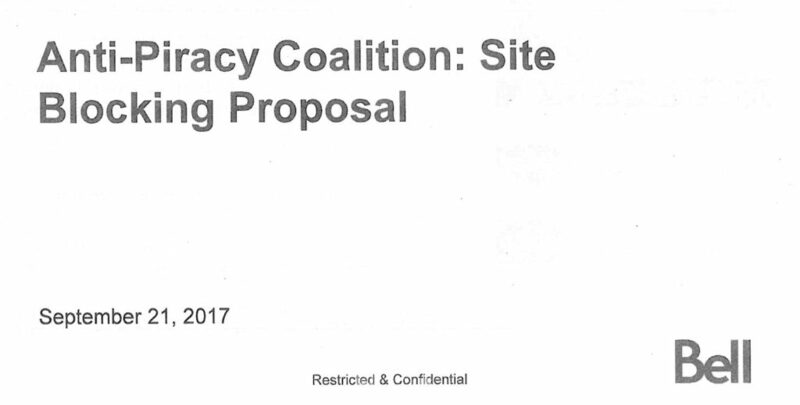 The internal documents, obtained and posted by the Forum for Research and Policy in Communications, indicate that the groundwork for the site blocking proposal was laid in the summer of 2017, well before public filings or press reports. 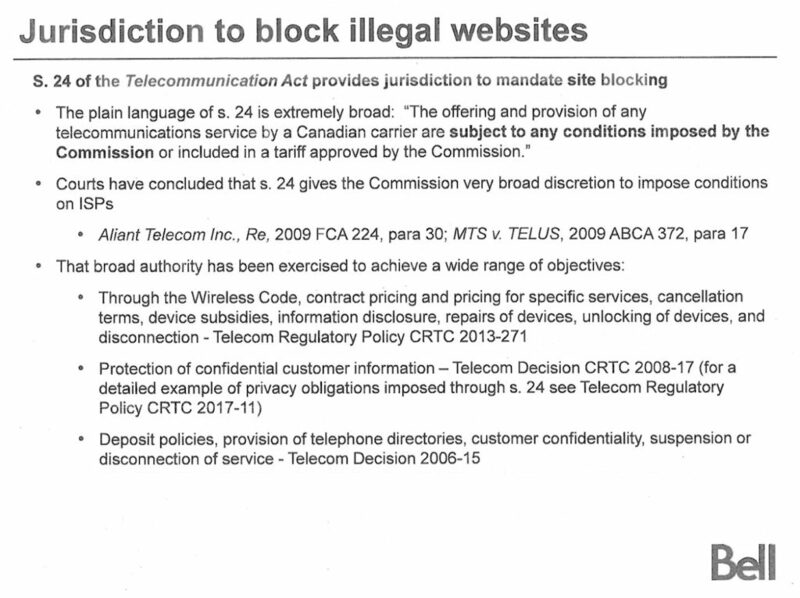 As far back as July 2017, Bell executives pressed CRTC commissioner Christopher MacDonald for a meeting with all CRTC commissioners and senior staff to make its case for a commission-backed site blocking system. The CRTC and Bell were asked about the report yesterday by Mobile Syrup. 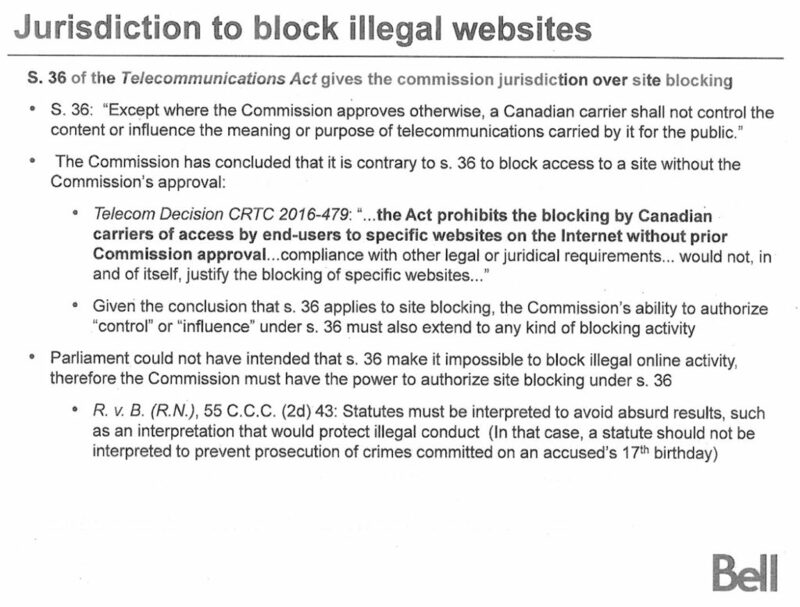 The CRTC responded that there “is nothing procedurally unusual in this case”, noting that stakeholders can raise any issues that are not formally before the commission. In other words, the commission takes the view that companies are free to lobby without limit until the moment of filing, thereby laying the groundwork for a proposal with commissioners and commission staff without having to respond to public commentary. In this case, the presentation led to the drafting an internal legal memo on the issue well before the public filing. 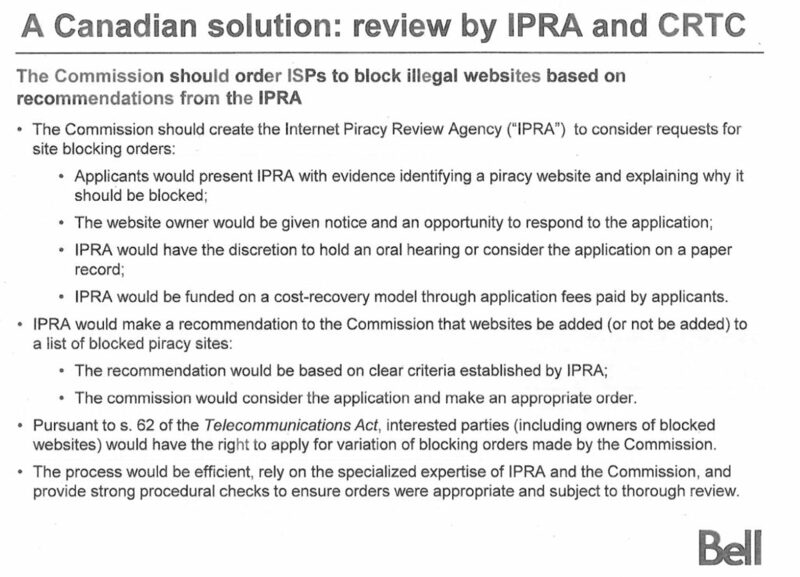 As for Bell, it says that it “has not met with CRTC commissioners to review the FairPlay application.” Given that the calls and meetings took place months before the formal filing of the application, that statement is technically true [A Wire Report report indicates the meeting was with CRTC officials, not commissioners]. The presentation itself, however, largely mirrors the actual application, with a detailed review of the law and policy arguments. The actual Bell filing can be found here. 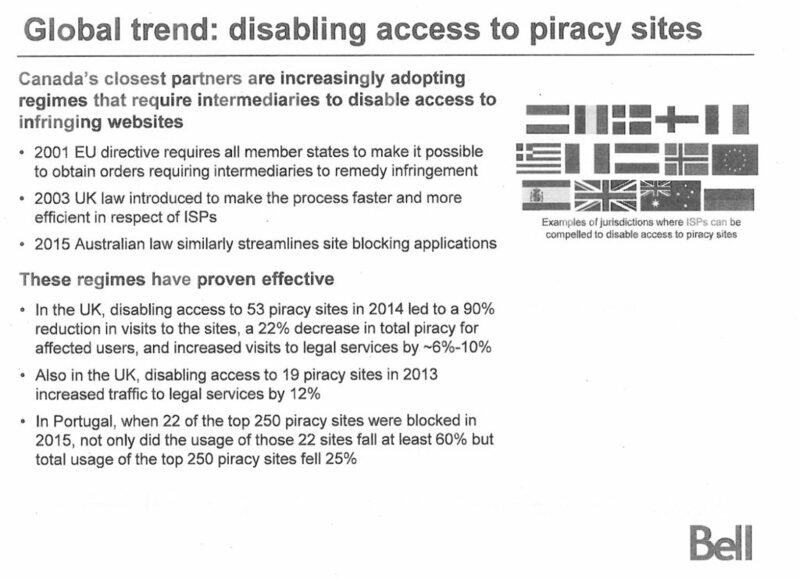 The slides from the presentation, which follow the same line of argument and contain the same information, are posted below. Canadians can judge for themselves whether the CRTC was wise to offer a private meeting pitching the forthcoming proposal and whether there is a meaningful distinction between the proposal Bell secretly presented to the CRTC and its actual filing. So not only does Bell’s FairPlay not “play fair,” it parses the words of its reply to you so as to call day night. What an outfit! It’s why I will never do business with Bell Canada. Seems like the CRTC commissions should resign. That would make sense, but only if ethics is considered a thing – which it isn’t in that world.